Can making make us happier? We are always looking to improve our well-being, finding a stress free environment away from our daily routines. From meditation apps to colouring books, we are bombarded with apps and choices of how to relax and feel better. Can making fit into this? In her book Craftfulness, author Rosemary Davidson examines the benefits she discovered from knitting while seeking refuge in her friend Arzu Tahsin’s home. While Arzu worked on book-binding, Davidson immersed herself in the clicking of her needles and felt that day’s woe subside. This led to a regular session of making, to maintain a more balanced stress-free life. Knitting or book binding may not be to everyone’s taste but finding an activity that allows us to disengage and refocus can be beneficial. 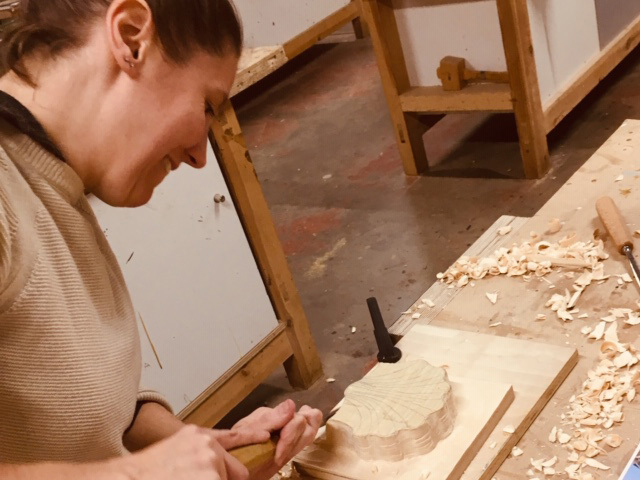 Maartje Schalkx recently attended our six-week woodcarving course taught by Laura Anderson. Maartje works as a paper restorer at Foley Schalkx, a job that very much uses her hands, but often for very fidgety time consuming work, where a mistake can cost and may not be correctable. She had an interest in woodcarving but had never tried it before, she joined the Monday night course last year. Standing around the work benches in a small group, talking together as they worked, the experience became shared. The course involves making a relief carved scallop shell from a square wooden block. Laura guides you through roughing out, forming the basic shape before using the chisels to create finer details. Maartje found herself immersed in the activity, the focus on the task in hand allowed to clear her head and concentrate on what she was doing, which alleviated stress that she had been feeling. Any mistakes were easily rectified by making new cuts, and any concerns she had about the physical strength needed to carve were unfounded. With her carved shell taking pride of place on her bedside table, Maartje has decided to further her skills by coming back to join the advanced course. Have a look at our range of courses below, no previous experience is required, starting from just one evening, there is always time to make.